Can China be green? A case for China becoming a leader in developing a low-carbon economy. Believe it or not, there’s a case to be made that the nation can develop a low-carbon economy. People wear masks at the Temple of Heaven Park on Feb. 24, 2014, in Beijing. Here’s an idea. What if China could evolve quickly from the world’s environmental problem to the world’s provider of environmental solutions? This isn’t a Slate pitch. (Actually, it is, since I’m doing a column about it.) But it’s also a reasoned, slickly argued narrative I heard from Peggy Liu, a Silicon Valley veteran turned social entrepreneur, in her apartment/office in Shanghai last week. 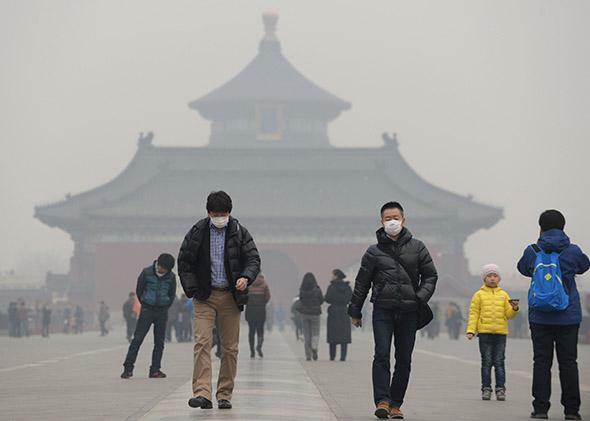 China is a relentless and largely unapologetic polluter and consumer of energy. It burns more coal than the rest of the world and adds a huge amount of new coal-generating capacity each year. The air quality ranges from poor to abysmal. But China, which largely sat out the 20th century when greenhouse gas emissions got going in earnest, believes it shouldn’t be held responsible for cutting them now. Its people have just started to consume energy, to drive, to use electricity. And despite the progress and gleaming towers of Shanghai, China remains a very poor country with hundreds of millions of people living in premodern conditions in the countryside. Liu concedes all this, but she also argues for an alternative narrative. (A PowerPoint summing up her argument can be seen here.) Educated at MIT and a veteran of McKinsey and several Silicon Valley startups in the 1990s, Liu runs JUCCCE (Joint U.S.-China Cooperation on Clean Energy), which promotes dialogue and training toward a more green and sustainable China. Ultimately, China needs to decouple energy from economic growth and to decouple carbon from energy. The U.S. has already done so. The question is whether China can. Liu says the answer is yes. In fact, she argues, there are multiple reasons China can go from the world’s biggest polluter to the world’s clean energy leader. Hers is an argument based on what might be called politico-economic anthropology. What are China’s advantages? First, centralized control. “This is more of a multinational corporation than a democracy,” she says. So when China makes a decision to adopt new technologies, it can implement them quickly. China started building a high-speed rail system in 2007 and by 2012 had the largest and fastest in the world. The country builds subway systems like nobody’s business. Another benefit of centralized control is that China is really good at banning things and proscribing certain behavior. In 2008, China banned giving away plastic bags, and they’ve largely disappeared from use. The government can have an immediate impact on social norms. Unlike GM or IBM, China thinks in five-year terms rather than quarterly results. Because of the penchant for long-term thinking, Liu argues, China’s government is more willing to make investments in energy-related areas that may take a long time to pay back. The concentration of power is also an advantage, since a few decision-makers can catalyze large shifts quickly. Convince a few key decision makers of the necessity of change, and you’re in business: China State Grid covers 80 percent of the country, and it has started to embrace large investments in making the grid more intelligent and efficient. Some of the aspects of China’s commercial culture that others regard as vices may be virtues. China is willing to learn and tweak technologies made by others, and to experiment with them. Aside from knocking off consumer goods, in other words, China is “taking every commercially viable technology and experimenting with it at city scale,” Liu says. China has seven pilot regions working on cap-and-trade schemes and 29 cities working on rolling out LED street lighting. “All we need is one to hit the bull’s-eye, and then we scale it up,” Liu notes. But here’s the thing. If China were an evolved economy in which the link between growth and energy consumption was already broken, then China would be set up to lead. All the things it is doing—high-speed rail, cap-and-trade, etc.—are what the U.S. could and should be doing at scale. But there are two big obstacles. Second, and more significantly, for all the lip service you’ll hear in Shanghai and Beijing about a different model of development, China is continuing its breakneck pace of unsustainable development in the interior. Before arriving in Shanghai, I had spent a few days in Wuhan, a massive city in the interior. A thick layer of haze and smog masked the sun, in part because farmers were burning agricultural waste. Columns of massive apartment and office buildings rose in every direction from the Yangtze River; I doubt they were utilizing the latest in insulation. Buses, cars, and motorbikes jostled for position on clogged roads. Until 2012, Wuhan had the distinction of being one of the only cities in the world with 10 million people and no subway. This was perhaps the least walkable city I’ve visited. But here, too, China’s advantages—centralized authority and decision-making, a culture of engineering, rapid execution—could come in handy. Imagine if China could simultaneously slow down its hurly-burly pace of development for a few years while rapidly ramping up its green efforts and imposing higher standards on everything from construction to vehicle mileage. That would really make China a global leader.